The University of Florida is proud to receive a visit by the First Lady of the United States, Michelle Obama. Mrs. Obama is a graduate of Princeton University and Harvard Law School, an advocate for U.S. military veterans, actively campaigns to reduce childhood obesity, and started the first White House vegetable garden since Eleanor Roosevelt served as First Lady. She is a mom, a lawyer, and a role model for many young women and men. 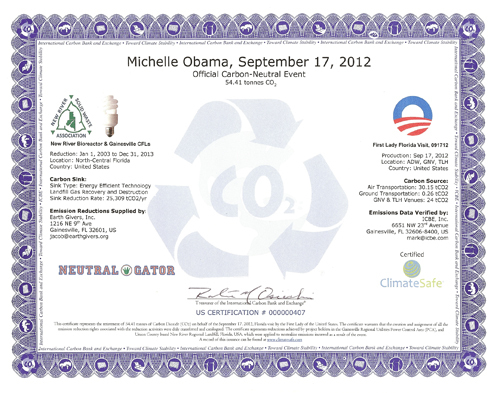 Neutral Gator is honored to offset the First Lady's trip to Gainesville and Tallahassee this beautiful September Monday.